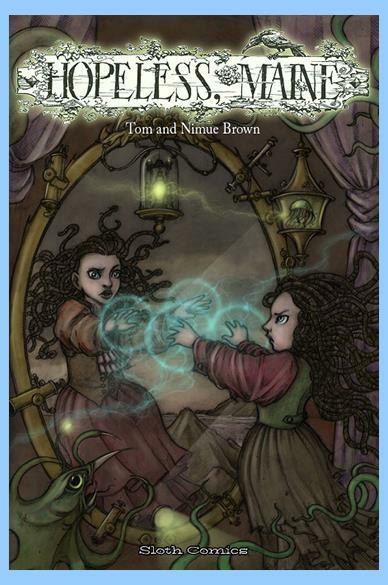 It is a rare pleasure to encounter a creation that is as fresh, invigorating, and quite so enticing as Hopeless, Maine. Which is why I want to share it with you here, point you in its direction. Watch out, though. Step foot there and you may never want to leave (even if you have that choice). Hopeless is a strange, gothic island off the coast of Maine, cut off from the rest of reality for the greater part. Hopeless Maine is also a graphic novel series, the peculiar child of Tom and Nimue Brown. A taste of island life can be found at the Hopeless Maine website. 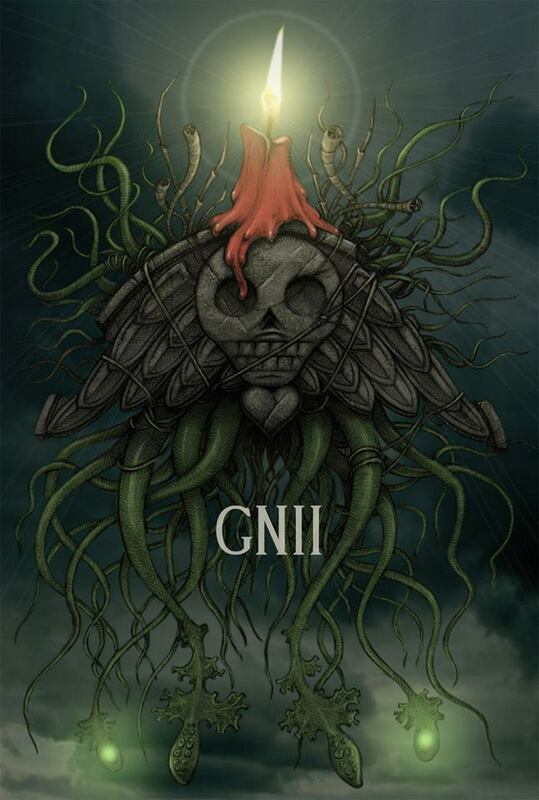 To most people on the island of Hopeless, a gnii is a strange little light in the sky, often seen flying over the island in flotillas. Older residents may remember the giant, oceanic gnii who were once hunted for their oil, but those creatures have not been seen in a long time. Common gnii are not unlike squid, aside from their habit of carrying bits of gravestones about with them. Nature has blessed the gnii with a silk balloon, but not the means to inflate it. They have learned to steal candle ends and affix them to stone fragments. They are also known to by shy and will generally put their stone between them and anything that might be looking, leaving only a few tentacles to give away their presence. The name ‘gnii’ is derived from the sound they make on hitting the ground. Cooking instructions: If fried at a very high temperature until crispy, gnii are just about edible. However, if the silk balloon isn’t properly removed it will cause choking and death. This is not just worth it for yourself – a glorious adventure with which to haunt yourself – but consider what a wonderful gift this would be for others at this time of year. So why not push out the boat and see just what the island of Hopeless is like.